Duck's wings are tired. It's been a long flight. He flops his feet. He flaps his wings. No go! Duck is stuck in the frozen pond. Uh-Oh! It wouldn't be so bad to get stuck in the muck. Ducks love swamps and swamps are mucky places. It's not so unusual to be stuck in a truck. Trucks break down a lot. But... a duck stuck in the ice? Snowflake the rabbit comes along and is curious. "HOW IN THE WORLD DID YOU GET INTO THAT SITUATION?" Duck has to explain the obvious and ask a bunny for help. Snowflake obliges, with vigorous thumping from her fairly impressive back feet. No cracks. Blackbird lands on the ice with the same question. He pecks at the ice. Not a dent! Next the now familiar question comes from the Moses the Moose. Moses has four big hooves, but he's afraid he'll crack the ice and then they'll all fall in the drink! Who can help? Just then a little fish named Rachel observes the problem from the underside of the ice where Duck's feet are quietly turning blue. And she knows what to do! Quickly she swims to the lodge of the best animal plumber in the pond--Bert the beaver! And Bert the Beaver's got just the tool for the job. He applies his big wide tail to the problem. 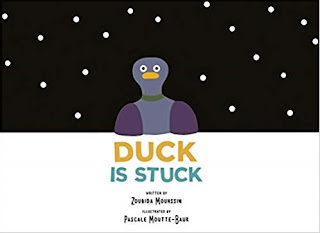 And Duck finally catches a break, in Zoubida Mounssin's Duck Is Stuck (Clavis, 2018). Mounssin's critter characters deliver their repetitious lines in perfect deadpan style, while illustrator Pascale Moutte-Baur provides the humor on her pages divided by the ice, with the mortified Duck shown above and below. Her clever illustrations have the look of paper collage and utilize both split page and varying perspectives to heighten the theme of crowd-sourcing cooperation! Three cheers for teamwork!